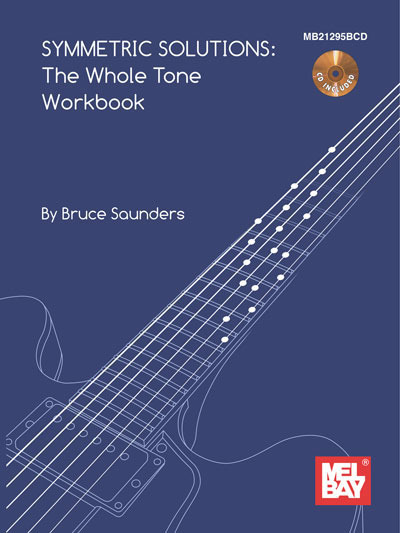 Symmetric Solutions: The Whole Tone Workbook author Bruce Saunders uses exercises, etudes and chord progressions from jazz standards to explore the sound of the whole-tone scale, the augmented scale and drop-2, drop-3 and drop-2/4 chord voicings applicable to them. Blues, rhythm changes, Giant Steps, patterns, approach notes, "across the bar line" phrasing, examples from jazz greats such as Joe Henderson, Wes Montgomery, Mike Stern and Wayne Krantz among others. This book is full of great sounds that you can use on standard jazz progressions, vamps, funk tunes, Brazilian tunes -- whole-tone can be used just about anywhere.